Few athletes have achieved the level of success, generated as much interest and created so much discussion as Team Penske’s Brad Keselowski in his first nine full seasons competing at NASCAR’s highest level. Brad after winning at Martinsville in April 2017. As he builds on his remarkable success thus far in his young career, behind the wheel of both the No. 2 Ford Fusion and the No. 22 Ford Mustang in 2018, the former NASCAR Xfinity Series (NXS) and Monster Energy NASCAR Cup Series (MENCS) Champion can rely on his strong roots in the sport to help chart his path for the future. 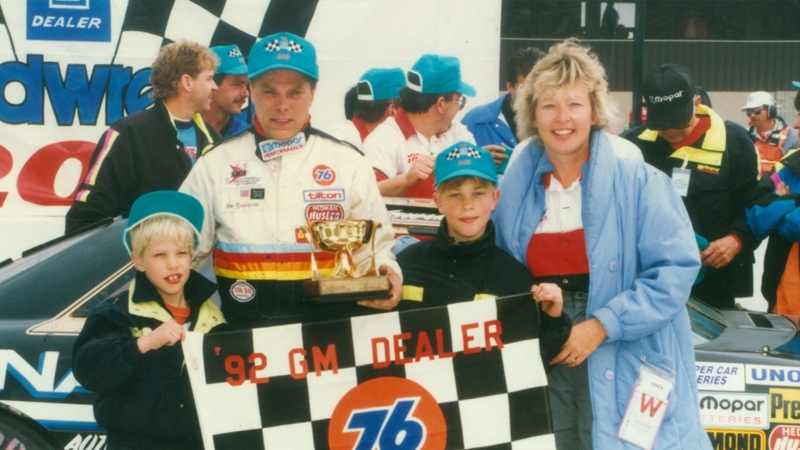 Growing up in a racing family, Keselowski was well aware of the sacrifices that needed to be made to reach the top level of NASCAR competition. After years of climbing the rungs of the NASCAR ladder, Keselowski earned the opportunity to get behind the wheel of one of the most iconic rides in motorsports history – the “Blue Deuce” heading into the 2011 season. 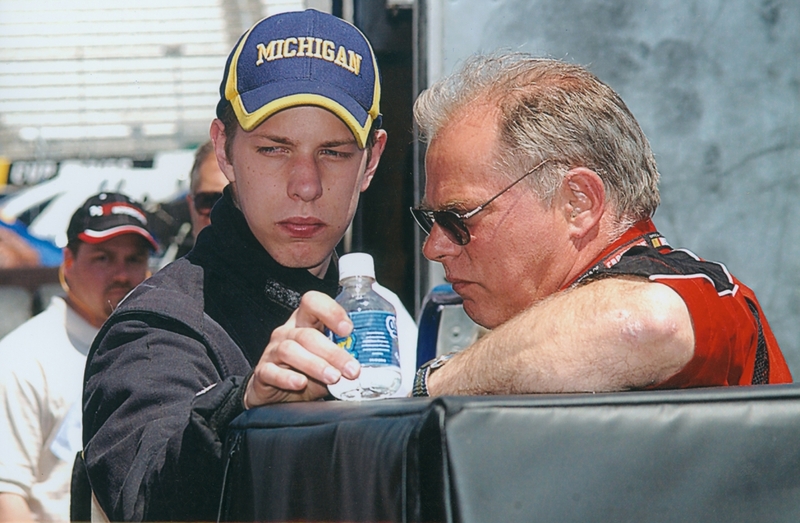 Keselowski was raised in an environment where spending time at the race shop and the track was just a way of life. His father, Bob Keselowski, was a 1997 race winner in the NASCAR Camping World Truck Series (NCWTS). His uncle, Ron Keselowski, competed at the Cup Series level in the early 1970s. At the age of 14, Keselowski made the transition from turning wrenches for his family-owned team, K Automotive Motorsports, to racing. He started competing in the Senior Honda 120 Quarter Midget division in 1998. In his first season, he earned six feature wins. The next year, he moved up to the Senior Honda 160 Quarter Midget division where he won eight feature races and the championship. In 2000, Keselowski began racing stock cars in the Factory Stock division. That season, he collected nine feature wins as well as Rookie-of-the-Year honors at two Michigan tracks – Auto City Speedway and Dixie Motor Speedway. BRAD WITH HIS FATHER, MOTHER, AND OLDER BROTHER, BRIAN. During the next three years, Keselowski balanced his budding racing career with his full-time job working for his family’s NCWTS operation. He advanced to the Limited Late Model and Super Late Model divisions and continued to rack up wins, despite competing on a limited basis. In 2001, he earned five fast qualifier positions, one feature win and five top-five finishes. During the next two seasons, he collected 11 fast qualifier positions, two Super Late Model wins, two Limited Late Model victories and nine top-five finishes. Keselowski graduated to NCWTS competition in 2004 as he drove the truck operated by his family’s team for eight races. The following season, he ran the full NCWTS schedule. His best finish was seventh, which he recorded in February 2005 at Daytona International Speedway. In 2006, Keselowski continued to gain more NASCAR experience as he ran a partial schedule in both the NXS and the NCWTS. He earned valuable seat time as he competed in 13 combined races – seven in the NXS and six in the NCTWS. That experience prepared him for 2007, when he caught the eye of Dale Earnhardt Jr., owner of JR Motorsports. Keselowski entered the 2007 season expecting to compete full-time in the NXS for Keith Coleman Racing. But Keselowski had to alter his plans when the team suspended operations in June. Keselowski, who already raced in two NCWTS events earlier in the season, was given another chance later that month when Germain Racing needed a last-minute replacement for Ted Musgrave in the NCWTS race at Memphis Motorsports Park. Though Earnhardt was aware of Keselowski’s talent, he really became intrigued as he watched the young driver win the pole position, lead 62 laps and compete for the win that day in Memphis. What struck Earnhardt the most about Keselowski was how he handled himself on the track, especially after being spun out with 10 laps to go by eventual race winner Travis Kvapil. Keselowski still salvaged a 16th-place finish after the incident. The race was the turning point in Keselowski’s NASCAR career. Realizing how much Keselowski had to offer, JR Motorsports signed the young gun to drive the No. 88 car in the NXS. Keselowski made his debut for JR Motorsports in the July 2007 NXS race at Chicagoland Speedway. He earned a 14th-place result – the first of eight top-15 finishes he would score during the season. Keselowski competed in 27 races in all, but earned his best results driving the No. 88 entry, recording five top-10 and eight top-15 finishes in 14 starts. In 2008, Keselowski enjoyed a banner season. He finished third in the NXS standings as he produced wins at Nashville Superspeedway and Bristol Motor Speedway in his first full season of NXS competition. He also earned one pole position, 11 top-five and 20 top-10 finishes. A YOUNGER BRAD AND HIS FATHER, BOB. The promising racer led laps in 21 races for a total of 295 as he earned the WIX Filters Lap Leader Award for 2008. Keselowski also was chosen by the fans as the NXS Most Popular Driver. On Nov. 2, 2008, Keselowski made his MENCS debut at Texas Motor Speedway, driving the No. 25 entry for Hendrick Motorsports. He climbed from his 37th starting spot to finish 19th. Later that month, he made his second MENCS start and finished 23rd in the season-finale at Homestead-Miami Speedway. The 2009 campaign was a season to remember for Keselowski. Not only did he capture four victories and two poles in the NXS, but he won the biggest race of his career to that point when he took the checkered flag at Talladega Superspeedway in April, marking his first MENCS victory. Later in the season, Keselowski came on board at Team Penske and the rest, as they say, is history. During the final three MENCS events of the 2009 season, Keselowski took over the No. 12 Team Penske car and he earned a top finish of 25th at Homestead. Keselowski earned four top-10 results in a total of 15 MENCS starts during the 2009 season. He once again was a force in the NXS as he finished third in the championship battle for the second consecutive season and he was also voted the Most Popular Driver in the series for the second year in a row. In 2010, his first full season as a member of the Team Penske family, Keselowski did something that no other driver in motorsports history was able to accomplish – he captured the first NASCAR championship for legendary team owner Roger Penske. With Wolfe calling the shots, Keselowski re-wrote the record book as he won the 2010 NXS title. He also won his first career MENCS pole at New Hampshire Motor Speedway in September to go along with two top-10 finishes and nine results inside the top-15 behind the wheel of the No. 12 machine. The confidence level for Keselowski remained high as he prepared for his first season behind the wheel of the “Blue Deuce.” The 2011 season was full of firsts including Keselowski’s first MENCS win with Team Penske – which came at Kansas Speedway in June – his first berth in The Chase for the Championship and his first top-five finish in the championship standings. These accomplishments all led to a breakout year for the driver of the No. 2. Following a slow start to the 2011 season in which Keselowski was mired in the 28th position in the point standings after nine races, his season began to turn around following a third-place finish at Darlington Raceway in May. 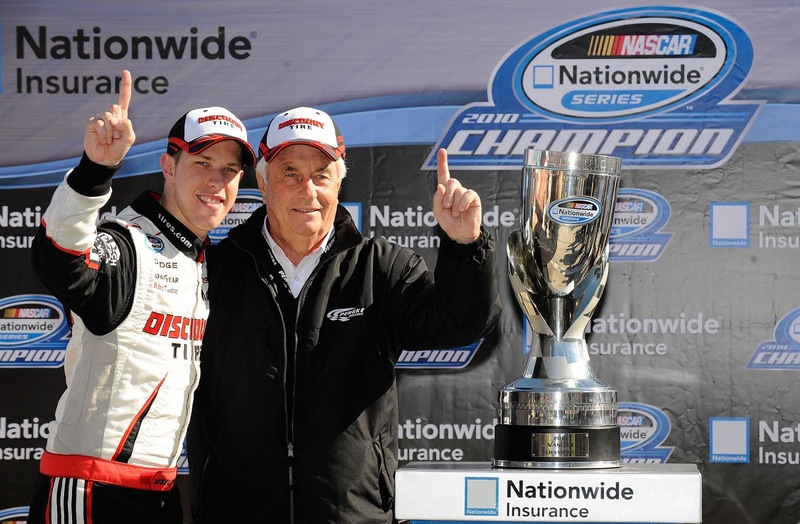 BRAD, 2010 XFINITY SERIES CHAMPION, AND OWNER ROGER PENSKE. He followed that up with a pole position at Charlotte Motor Speedway the following week. His win at Kansas completed a three-week stretch that propelled the team to torrid summer portion of the schedule that included two more wins at Pocono Raceway and Bristol Motor Speedway, respectively, and the No. 1 “wild card” spot in The Chase for the Championship. In one of the gutsiest performances in recent sports history, Keselowski picked up his final two victories, along with two more top-three finishes, in a four-race stretch that began immediately after he broke a bone in his left ankle during a testing incident at Road Atlanta in early August. This earned him the 2011 Dale Earnhardt Tough Driver Award by The Sporting News and the respect of everyone in the garage. Though he wasn’t able to defend his championship in the NXS, Keselowski continued to produce at a high level in the No. 22 Discount Tire Dodge in 2011. He earned five wins and four poles in 29 races as he scored his 17th career NXS victory. Still, it was his impressive performance at the MENCS level as the season wore on that made 2011 so special. The 2012 season is when Keselowski turned dreams into reality by winning the first MENCS Championship in Penske Racing history, in just his third full season with the team. The championship gave Roger Penske the only title that was missing on his resume in his nearly 30 years of competing in NASCAR, and it firmly established Keselowski as one of NASCAR’s true superstars. Keselowski produced career best results on the way to his first MENCS title and his second championship for Team Penske to go along with the NXS crown he won in 2010. Keselowski recorded a single-season career-best five race victories including regular season wins at Bristol, Talladega and Kentucky Speedway and two victories during The Chase at Chicagoland and Dover International Speedway. Keselowski also set career bests with 13 top-five and 23 top-10 finishes – a record for the “Blue Deuce” – as well as 735 laps led. In addition to his MENCS title, Keselowski also built on his success in the NXS in 2012 as he continued his winning ways in the No. 22 car for the third consecutive year. Competing in 21 races, Keselowski posted wins at Charlotte, New Hampshire and the inaugural NXS race at Indianapolis Motor Speedway as well as 11 top-five and 14 top-10 performances. Though he was not able to defend his MENCS title in 2013, as the No. 2 team did not secure a spot in The Chase, Keselowski did continue his winning ways as he won the fall race at Charlotte. He also added to his legacy in NXS competition as he posted seven wins and helped earn the first-ever NXS Owners’ Championship for Roger Penske. That production helped set the table for one of Keselowski’s most productive seasons ever in 2014. 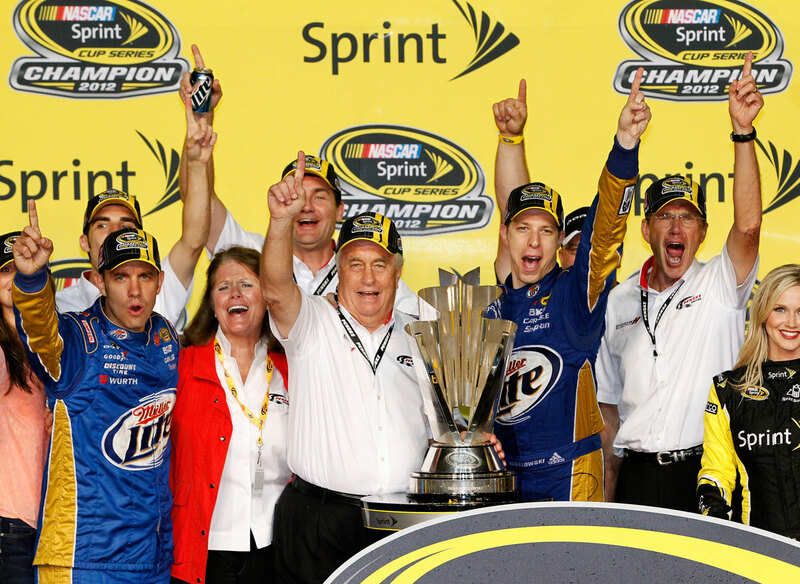 In 2014, Keselowski claimed a series-leading six victories in MENCS competition. He also produced a single-season career-high five pole positions while earning the second-most Coors Light Pole Awards among all drivers that season. Driving the Miller Lite/Alliance Truck Parts/Wurth Ford Fusion, Keselowski was the only driver to sweep both the NXS and MENCS races in a single weekend, a feat which he accomplished twice (Las Vegas Motor Speedway and New Hampshire) in 2014. BRAD, 2012 CUP SERIES CHAMPION. The Rochester Hills, Mich., native also scored Team Penske’s landmark 400th race victory when he took the checkered flag at Richmond International Raceway and he won back-to-back races at Richmond and then Chicagoland. After returning to The Chase in 2014, Keselowski continued to produce in the postseason as he won twice (Chicagoland and Talladega) in the new Chase format to finish fifth in the final championship standings. In the NXS, Keselowski started 11 races, in which he scored five poles and five victories as he helped the No. 22 Ford team claim its second consecutive NXS Owners’ Title. With the productive season, Keselowski moved up to fifth on the NXS all-time win list with 32 career victories. After a career-high six wins in 2014, Keselowski came through with another career best in 2015 – 25 top-10 finishes. That sent him all the way to the Eliminator Round in The Chase for a second-consecutive season. In the meantime, the Team Penske NXS crew added a third straight Owners’ crown for Mr. Penske. In addition to his two wins and nine top-10 finishes in nine NXS starts, Keselowski won one for “The Captain” on the MENCS side as well. He made a last-lap pass at Auto Club Speedway for his first win at the track built by the Team Penske owner. Off the track, Keselowski and long-time girlfriend welcomed their first child, Scarlett, in May of 2015. The 2016 season saw Keselowski return to his winning ways, grabbing four victories on the way to his third-consecutive Chase appearance, though his championship bid ended in the Round of 12. The highlight of the season came at Daytona, where Brad drove the Detroit Genuine Parts Ford to a signature win at the series’ most prestigious track in July. That win also happened to be the 100th MENCS victory for Team Penske, a true milestone in a young career full of them. Brad also nabbed his fourth-career win at Talladega, his third at Kentucky and his second at Las Vegas. Winning wasn’t the only thing Keselowski did consistently, he finished in the top five a remarkable 16 times, one shy of a career best, and posted 22 top-10 finishes, his third-straight season with at least 20 top-10 results. While remaining consistently strong in the NXS driving the No. 22 Ford Mustang to five top-five finishes and 12 top-10 results in 15 starts, Keselowski could not secure an NXS win in 2016, the first time in nearly 10 years (2007) he didn’t reach victory lane in the series. Keselowski picked up a big win off the track in 2016 when he proposed to his girlfriend, Paige White, following the conclusion of the race season. White said yes, and the couple married in February 2017. 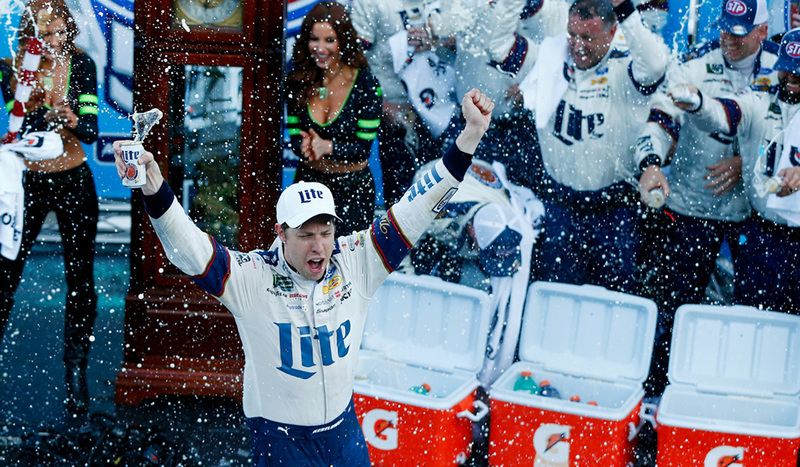 Starting the year off on a high note, Keselowski catapulted his off-track good fortune to three victories and a fourth-consecutive appearance in The Playoffs. In his eighth full-time MENCS season, Keselowski picked up his three wins of the season at Atlanta, Martinsville Speedway and Talladega. He also earned 15 top-five and 21 top-10 finishes, with 778 laps lead on his way to finishing fourth in the 2017 driver point standings. His 2017 season success continued in the NXS collecting two victories with the No. 22 team at Pocono Raceway and Richmond. In addition to the two wins, he capped off the season with seven top-five and nine top-10 finishes in nine starts with 308 laps led. The 2018 season saw Brad achieve some big milestone victories. After grinding his way through the early stages of the season, BK hit his groove in September, winning three consecutive races, including back-to-back “bucket list” wins at Darlington and Indianapolis, closing the regular season on an incredibly high note. He followed up those wins with one at Las Vegas to open the playoffs in front, that win also marked Team Penske’s 500th overall. Brad ended the season with those three wins, his eighth straight season with a Cup Series win, and sixth in the last eight with at least three victories. Additionally, BK tallied three wins in the Xfinity Series in 2018, where he went 3-for-5 in his limited schedule, winning at Phoenix, Charlotte and Darlington. Over those five races, Brad led 276 laps, more than 1/3 of the laps he ran. Keselowski also continued his work in television as an analyst for FOX Sports on the NXS broadcasts and as a recurring guest on the show, “NASCAR Race Hub,” and he will remain a part of the channel’s lineup in 2019. One of the most self-driven and motivated drivers in the sport, Keselowski enters the 2019 season expecting great things, and one can believe that he will be primed with a laser-like focus to deliver his second series crown as he begins his ninth, full-time Cup Series season behind the wheel of the No. 2 Ford Mustang. Away from the race track, Keselowski and wife Paige are both active with Brad Keselowski’s Checkered Flag Foundation, which honors and assists those who have sacrificed greatly for our country. Since 2010, the foundation has supported more than 50 organizations and individuals in order to help veterans and first responders during their road to recovery.